Since MASH started installations in September 2014, over 1150 households in Central Victoria have chosen to go solar with MASH. Hear from some of our happy customers. 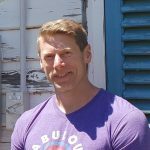 "I chose to go solar with MASH because I liked the idea that my solar installation was going to help community groups and schools get free solar power. The MASH solar supplier, Macedon Ranges Solar Power, were great - efficient, professional and kept me informed about what each step involved. I was amazed by how quick they were too - my system was installed in less than a month from when I registered with MASH. 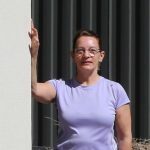 Now, I'm looking forward to generating my own solar power - and also to hearing which community group or school is going to benefit from the next MASH community bonus system." "I'd been aware of the MASH bulk-buy for a number of year. 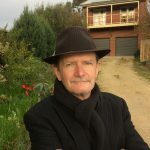 So when I left my off-grid home in the Chewton Bushlands and moved into Castlemaine, one of the top things on my list was to increase my energy independence by installing solar and a battery." "I like that the MASH project is community-based, provides economies of scale in terms of buying power. It was also useful to have the technology explained in laypersons language." 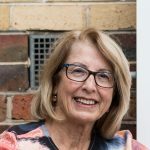 "I wanted to be supportive of the renewable energy push and in particular support the uptake of batteries in order to help more people become self-sufficient and not rely so much on the grid. 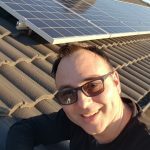 Now with my MASH solar system and Tesla Powerwall 2 battery, I expect that 7-8 months of the year I will be self-sufficient in terms of my electricity needs." 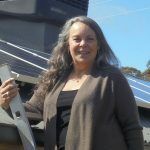 “I had solar on my Melbourne home. When we moved to this property in Castlemaine, which is both our home and my art studio, I wanted to power the operation with solar. I have used solar power systems in my artworks to study the energy dynamics. It’s such a reliable and strong technology. Earth science is very clear that in order to maintain a reasonable environment, we must reduce our carbon emissions." "The MASH info meeting at Castlemaine and was impressive. I could see that their research on components was very solid. I decided to invest in as a large a system as I could afford. I think in the future, decentralisation of power will become very important. 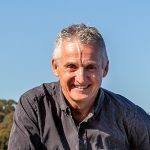 With the large amount of sunshine in Central Victoria, the MASH system will be producing a lot of power very quickly." "The installation was smooth. The MASH team installed a week early - and it took them only two and a half hours. Really impressive work." 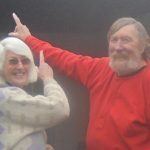 “We’ve just moved from Melbourne to Castlemaine. Top of our list was to go solar so we could reduce our carbon footprint and cut our bills. “Working out which solar company and panels to buy was really confusing. We like MASH because we’re confident that they have done the homework for us and researched the market properly. Also, we feel that there’s safety in numbers and MASH certainly has the scores on the board. The community aspect of MASH is also a great thing – how they-‘put back’ into our local community with free solar for schools and community groups. “We went with a 5kW system even though most of the time there’s only two of us here. That’s because we’d like to move the house to all-electric over time and with a bigger system, we’re all set to install a battery when the prices come down a bit. “We had the system installed just over 3 months ago. Already we’ve noticed a big difference in our electricity bills. They were around $130 a month and now they’re less than half that. My main reason for going solar is to be as green as possible. Solar energy is such a plentiful resource, the harvesting of which has no adverse impact on anything. For me, it's not about the money. I'd like to use much fewer non-renewable resources to minimise my environmental footprint. 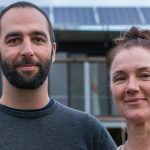 "We have been thinking of going solar for ages. So when we heard about the Victorian State Government solar panels rebate it seemed like too good an opportunity to pass up. We went with MASH because we like that the MASH supplier and solar systems have been endorsed by the Alternative Technology Association. We also like that MASH gives back to the local community with free solar for schools and community groups. Our experience with the MASH solar supplier, Energy Matters, has been great - very smooth." It was a key decision point for us that MASH has such a strong community benefit, in terms of donating free solar to community groups and schools. We were going to get solar anyway, but hearing from Jo Kaptein at the MASH project that we'd probably be eligible for the new State Government rebate was like getting an early Christmas present. We're rapt! The new system on the shed comprises of twenty JA Solar 260 watt panels on tilt frames positioned in an east/west split array on the shed and an Aussie line-up of powerful battery technology inside which provides up to 3 days of autonomous power for the house in case of cloudy weather. 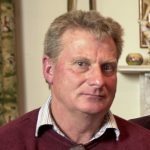 “I heard about the MASH solar bulk-buy at a climate change meeting in Bendigo. I looked into it and thought it looked good. I like that it is a grassroots community initiative to do something about cutting CO2 emissions", said Heather Stebbing, a MASH customer in Flora Hill, Bendigo. 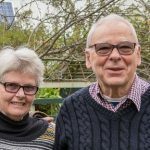 “I’m going on a pension soon and I need to make sure that we have a sustainable way of life into retirement”, said new MASH customer, Lidia Weil at her family home in Campbells Creek. “I highly recommend MASH to anyone who’s thinking about investing in solar for their home. MASH’S supplier Sunergy has been great to deal with too", said Lidia. 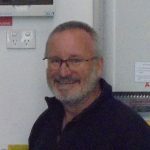 Richard Polak and his family recently had a 3.12kW solar system installed at their home in New Gisborne. 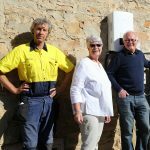 Woodend architect, Brad Hooper, is using his family home as a case study of how to transform a typical 1970s brick veneer into a comfortable home with a low carbon footprint – and MASH is part of the solution. We put a 5kW solar system on our coach house with MASH. We were really delighted with how MASH has organised everything and how smoothly it has gone. Well done MASH! 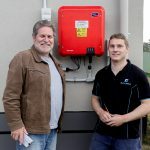 The new MASH system on our family home in Riddells Creek cost just over $7,000 for 5kW and features a top quality European inverter and high performance panels. It is amazing how far solar prices have dropped and how the quality has improved. Our electricity bills are around $3,200 annually. With the MASH installation, they are estimated to reduce by around $1,450 each year. That’s a payback of about 5 years, a decent return I reckon. What's more, with this MASH system we are reducing our family's greenhouse gas emissions by around 8 tonnes per year. This is equivalent to taking about one and a half cars off the road each year! 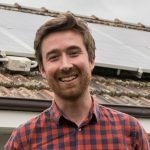 If you've been thinking about going solar, have a chat to the MASH team about their local not-for-profit option. We're thrilled to have one of the MASH community bonus systems. Our 2Kw MASH system has only been on a few weeks, but even having the panels on the roof has helped to insulate our roof and makes our living room cooler. And we're rapt to know that our bill savings should be around $700 each year - that's going to make a difference! We just bought a little portable air conditioner because we've now got solar. We put it on yesterday and it was terrific to be able to run it for free and keep cool. Morgan Kurrajong and his crew [part of the MASH solar installation team] were fabulous. Morgan explained everything to me and they did a great job installing on the roof. We check the readings on our inverter all the time as we're so excited to be producing our own power. 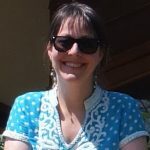 A huge thank you to you and the other wonderful people behind MASH. I wouldn’t have had the confidence - or time - to learn about how to install any solar system without your organisation’s support. You guys really made it possible. Thank you for following through on such a great vision. The installation went very smoothly, it looks great and we’re rapt that we’ve finally managed to go solar. We thought for a long time that we couldn't have solar due to the shading on our roof. But then MASH came along and we heard about the new technology that helps to minimise the impact of shading on panel performance. So we thought 'great' and got on board. And we're glad we did. Our electricity bill is about 25% lower since we had the panels installed. Plus we are doing what we can to make our beautiful 1850s home more sustainable for the future and to reduce our carbon footprint. We think it's a 'win win' all round! It was really clear that MASH was offering a premium product for less than you would pay somewhere else. We loved that it was a local installer and we found the process really easy and friendly. We also loved that MASH is a local organisation that is championing such an important issue. We're really happy to be part of the success of MASH and looking forward to seeing round 3 being even more successful. I just think it’s the right thing to do. The community gets something out of it as well in the end, putting solar on organisations that perhaps wouldn’t be able to do it themselves. I think it’s a good all round program. It’s one thing the community can do to say to the government, well, regardless of what you do, this is the way that it’s going to go. Electricity is very expensive – everything here, the machinery and so on, runs on electricity. The bills keep going up and up and up, so we wanted to slow it down. We've also put panels on our home. It’s pretty straightforward, isn’t it? Put the panels on and start saving money. We try to be a little bit community minded. I don’t know if MASH was dearer or cheaper – I didn’t go into that sort of research. I have no doubt I could have bought a cheaper system, but we bought the premium – because I only ever want to buy it once. It’s one of the advantages of waiting for a while is that we could afford to get it done right. The installation went very smoothly despite patches of rain. Morgan was just wonderful to deal with. He explained everything thoroughly and made extra efforts to fit in with my availability. The two young me assisting Morgan were fantastic too. The whole experience was a very positive one for me and I can't praise everyone involved highly. Our first reason for going solar was ethical as we don’t want fossil fuel industry to be running for too much longer. MASH organising the bulk-buy brought us over the line. That’s because MASH is reasonably priced and simplified the process. We haven’t had to worry about anything; it’s all gone smoothly. We like MASH because it is local and we know the people behind it. Before our solar, we used to rely on our wood heater to keep warm. Now with solar we run our split system for heating and cooling whenever we need and it's not costing us a thing. It has totally transformed our lives and kept us nice and cosy all winter without any hassle or worries. When we were ready to get solar installed we started to look around. Lots of solar companies called us. They were mostly nice and helpful but we were unable to distinguish between them. Then we heard about MASH through the local newspaper. We liked the fact that MASH is a community effort and is not-for-profit; it sounded genuine with good principles and we trusted that the Hub Foundation, the organisation behind the MASH project, had done the homework. Because our home is so energy efficient – and we are a 2-person household - our electricity bills are only around $260 per quarter. So probably a 3Kw panel system would have been enough if our main motivation was purely to reduce our bills. However we see going bigger with a 20 panel, 5Kw system as a contribution we can make to lessen our use of brown coal and fossil fuels. MASH is a terrific example of something that’s working successfully so we are very happy to be part of it. It is a community effort to change things so instead of feeling helpless we feel we can contribute a bit. It is important to us that MASH is a community project and that the community can benefit from it. We went to one of the MASH community meetings and made up our minds then and there to go ahead. All the environmental issues can sometimes feel overwhelming. Putting solar on my roof is something practical I can do, that helps. Linnet Good and Dev Mukherjee are renting a 3 bedroom property in central Castlemaine. Dev commutes to Melbourne on weekdays and Linnet works as a copywriter from home. Everything in the house runs on electricity including their heating, hot water, cooking and cooling. 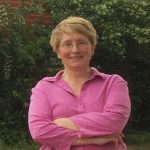 We’ve always been careful with our electricity use and turn off everything when we aren’t around, says Linnet. Despite this our electricity bills were high at around $2,640 per year. This was mainly because everything runs off electricity. But also the house isn’t very well insulated so a lot of power gets wasted and I really feel the cold in winter! Linnet and Dev had been thinking about going solar for a while. They knew that they had to come up with a win/win proposition that would benefit both them and their landlord. Linnet and Dev went to their landlord with an offer that they would pay an extra $25 per week in rent towards the cost of the panels ($1,300 per year) if the landlord purchased the solar system outright. This rental increase would pay off the capital cost of the solar PV system within 5 years, with an annual rate of return for the landlord of 5-7%. From meter readings so far, Dev says they are saving more than $25 per week on their bills. What has also helped is that they have shifted their power usage to daytime as much as possible when they are generating their own power from the sun. 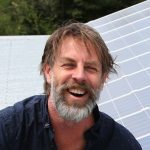 I believe every roof in Australia should have solar panels. That's why I put on a 3Kw solar panel system. With gas being so expensive, we want to ‘de-gas' our home over time. Our new MASH2 3Kw system is a great step towards this goal. For me, ‘going solar’ was really about what kind of world we are leaving to our children and grandchildren. We were number one [MASH] household off the ranks, the first installation in MASH Round One in early 2015. We installed 16 solar panels and the high quality 4Kw system provided, linked to the grid. MASH encourages the use of green energy at a local level and it’s affordable. 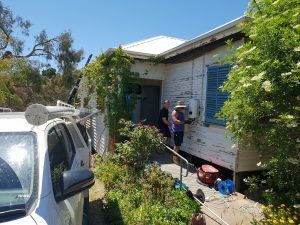 I am installing a 5Kw system with MASH for our 2 person household because I believe in creating green energy for our community – and I want a power station on top of my house!